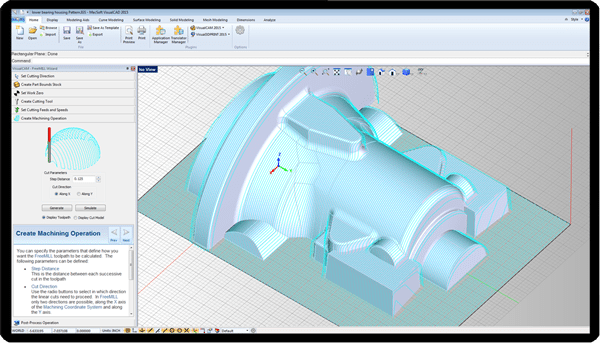 Looking for a completely free CAD/CAM software option? We offer two products to serve your CAD/CAM needs for no cost! FreeMILL, as the name indicates, is a free milling module for programming CNC mills & routers. FreeMILL coupled with our free CAD software, VisualCAD, gives you a great entry level CAD/CAM product that is completely free of cost. Yes, completely free with no time limits, number of tries limit, number of saves limit or lines of code limit! VisualCAD with its modern user interface, makes creation of 2D and 3D curves as well as 3D surfaces, solids and meshes easy and efficient. With a complete geometry creation and manipulation tool-set and fast shaded graphics and rendering, VisualCAD is a perfect system for first time CAD users and/or educational users. It includes numerous file importing capabilities such as DXF/DWG, IGES, STEP and other file formats making it also an ideal companion system for your mainline CAD system. Most of all VisualCAD is a completely free! FreeMILL is a module that is included in the VisualCAM product that runs as a plug-in inside VisualCAD. The table below summarizes the various features of VisualCAD. Note that even though you may choose not to purchase the VisualCAM product you can still run FreeMILL completely free of cost, while the rest of the CAM product will continue running in Demo mode, that is, without the ability to save CAM data or post-process toolpaths.